Dr. Steve Sayles, University of La Verne professor emeritus of history, died on Sept. 1 following a series of heart issues. He was 73. Dr. Sayles was a fixture at the University of La Verne from 1982 until he retired in 2015. During his 32-year tenure, he served as professor of history and chairman of the history and political science department, as well as chairman of the legal studies program. He also taught in the honors program. In his final lecture before retiring in 2015, Dr. Sayles spoke about his career and his experience being drafted into the Vietnam War. His initial selection in the draft was deferred until he completed his undergraduate work at Cal State Chico, where he received his bachelor’s degree in history. Shortly after graduation, Dr. Sayles educational deferment was up and the Army came knocking, he said during the 2015 lecture. A final opportunity to avoid the draft presented itself to Dr. Sayles while he was undergoing medical screenings. His anti-war family doctor offered him a medical reprieve due to a heart issue he’d had since childhood. But Dr. Sayles did not take the medical deferment, recalling his father and uncles who served in World War II, and his brother who was already serving in Vietnam. “I could not choose the wars that I would fight, and I could not choose the wars that I would not fight,” Dr. Sayles said during his 2015 lecture. He served with the 135th Assault Helicopter Company supporting South Vietnam soldiers in the Mekong Delta region. When he returned from Vietnam he continued his education. He earned his doctorate in history from the University of New Mexico. As a professor, Dr. Sayles was known for his encyclopedic knowledge of history, particularly the American West, as well as his ability to use media and pop culture to provide context of how historical events were received. Dr. Sayles taught an honors war and mass media course alongside Professor of Journalism George Keeler for more than 10 years. “Steve … brought in a set of values from a military perspective, and I was a journalism professor so I brought in the values of war in the mass media” Keeler said. “He was my mentor. He’s the guy who taught me to be a professor. He taught me the ways of the University, for which I’m forever grateful.” said Professor of History Richard Gelm, who was hired by Dr. Sayles in 1991. Provost Jonathan Reed said he was inspired by Dr. Sayles’ experience and his leadership. While Dr. Sayles did not look fondly on his time in Vietnam, it seemed to seep into his pedagogy in a positive way. “I think he experienced a transformation in the war that gave him an appreciation for pluralism, (that) different people can have different views about the same subject and that we should avoid being too insistent or dogmatic,” said Jason Neidleman, professor of political science and current history and political science department chairman. 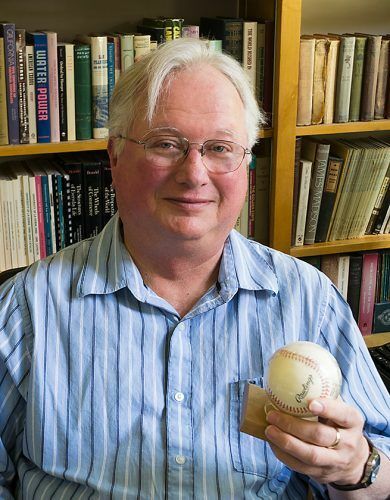 “Professionally, he was so well-read and so well versed, he was the consummate professor,” Gelm said. “On the personal side, I’d say he was the most honest and sincere person I have ever encountered in academia,” Gelm said. Dr. Sayles is survived by his wife, Barbara, and son, Dan, both University of La Verne alumni. There will be no public memorial, however, the department of history and political science plans to host an event for Dr. Sayles’ upcoming book. Michael Sprague can be reached at michael.sprague@laverne.edu.